Dungeness. May. 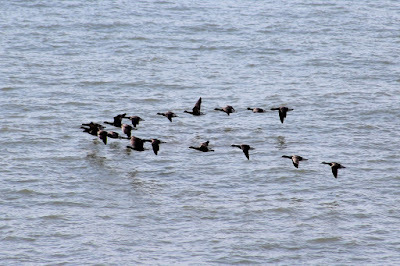 Pomarine Skuas. 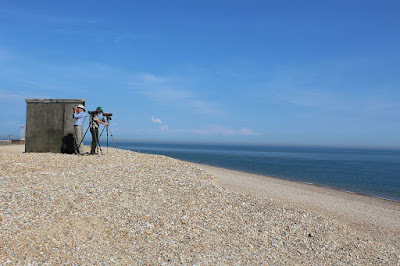 Last Sunday I set off at first light for a two-day birding stint at the shingle peninsula. 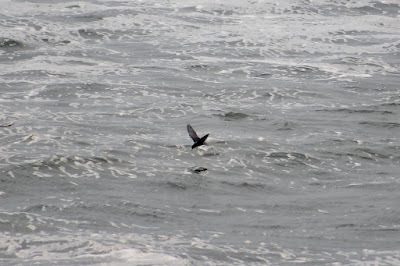 The main aim was to see migrating Pomarine Skuas. 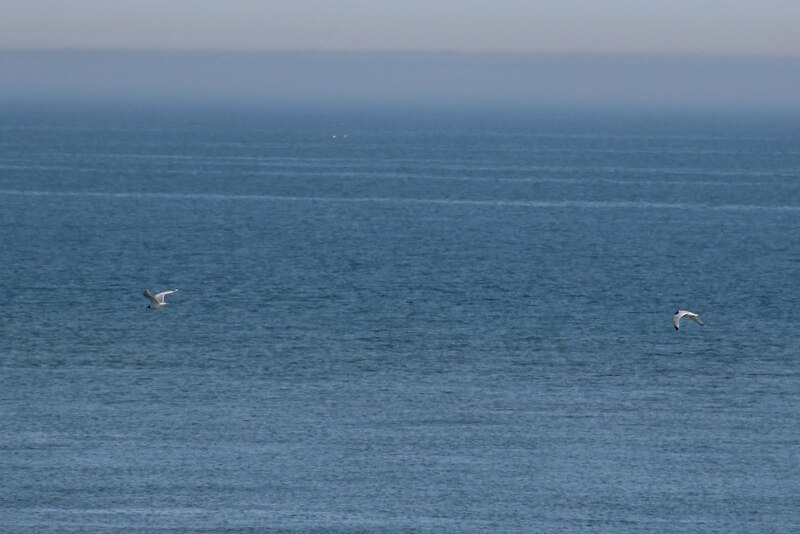 These charismatic seabirds head north during early May and if the wind is in the right direction the chances are they will fly east down the English Channel. 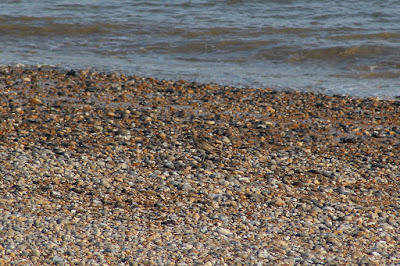 When they do Dungeness is probably the best place to see them. Last year it didn't happen, the passage of skuas almost exclusively favoured the west coast, with hardly a trickle along the southern edge of Britain. 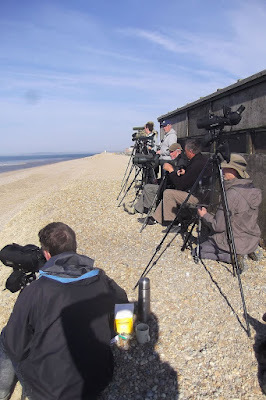 That disappointment was in complete contrast to the previous year when on May 5, 2014 more than 100 flew past many of the southern watchpoints, many very close to the shoreline, including at Dungeness. 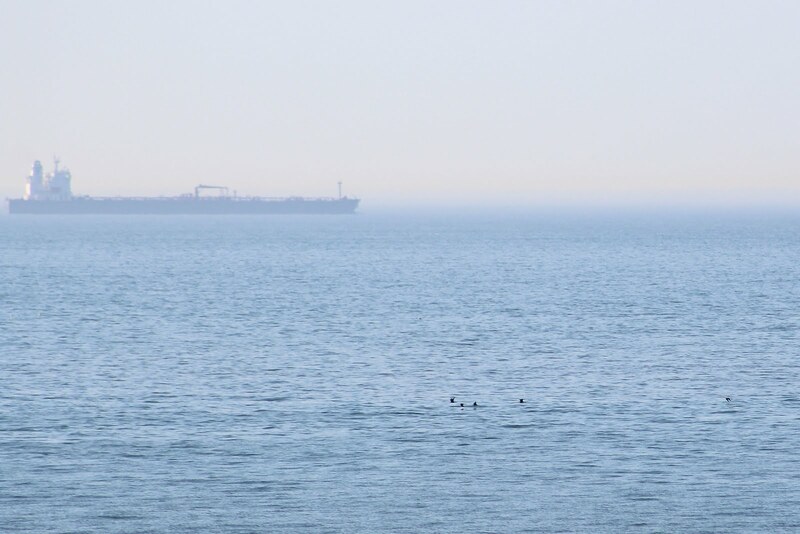 Last Friday I began to sweat a bit as a constant stream of Poms flew along the Channel. 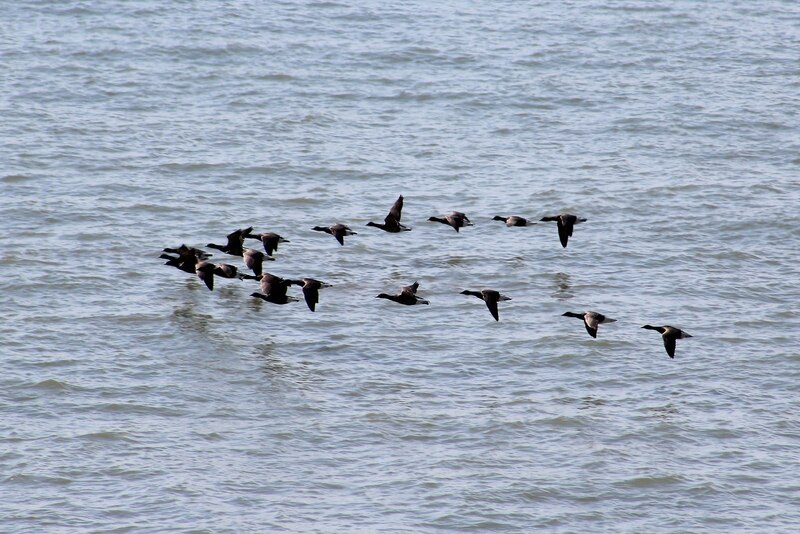 The count got higher and higher until at Dungeness it finished at 119 for the day. I was concerned the passage of Poms might run dry before I got there! I turned up on Sunday later than intended at 7.30am. The day would turn out to be a blisteringly hot, but with an occasional easterly breeze. The Dungeness birding cognoscenti were already in place. 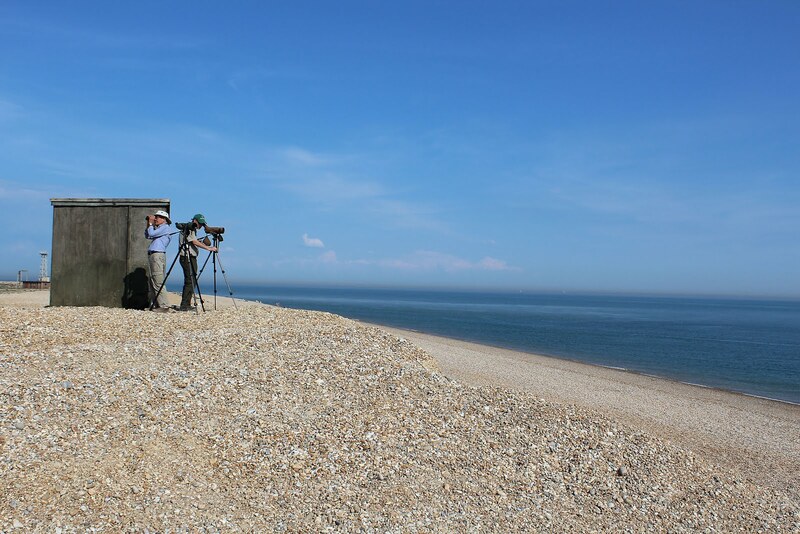 Martin Casemore, Tony Greenland, Dungeness warden Dave Walker, assistant warden and birding mate David Campbell and plenty of other birders already scanning the sea. Three Pomarines had flown past from first light but since then it had been quiet. Would I see any? I needn't have worried. 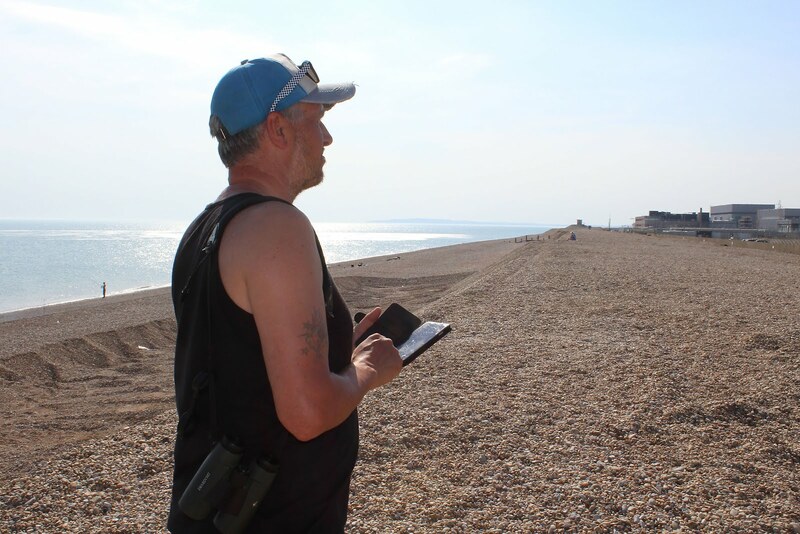 With Martin on skua patrol scanning the west it wasn't long before he called out "Pom!" 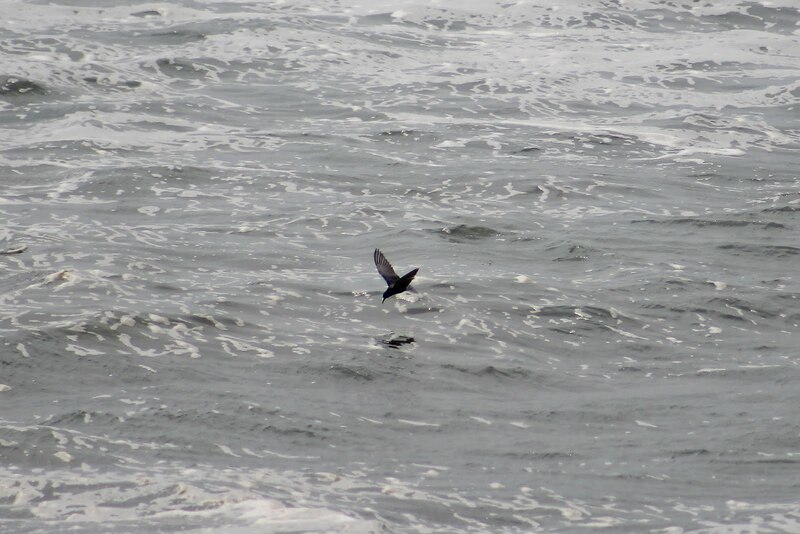 The accompanying birders scanned the sea and there it was, my first Pomarine Skua on the year. 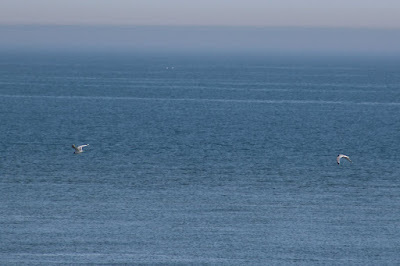 It languidly flew low across the sea to the outside of the Dungeness buoy as it continued on its journey east. Then 10 minutes later another shout of "Poms!" This time four birds, two with distinctive spoons, and at least one dark phase bird flew low across the pond straight out in front of us in the mid-distance. By 8.56 six Pomarine Skua had flown past, and by midday 19 of these wonderful birds had been seen though the scopes, 16 by me. Utterly brilliant. Pomarine Skua passage tends to happen during the early morning and late afternoon/evening, so it was an ideal time to go for a spot of lunch with David Campbell at the Britannia Inn. While there, out of the blue, old Beddington birding pal Roger 'Dodge' Browne appeared, having come down for the afternoon with his wife for a spot of birding and sun-basking. 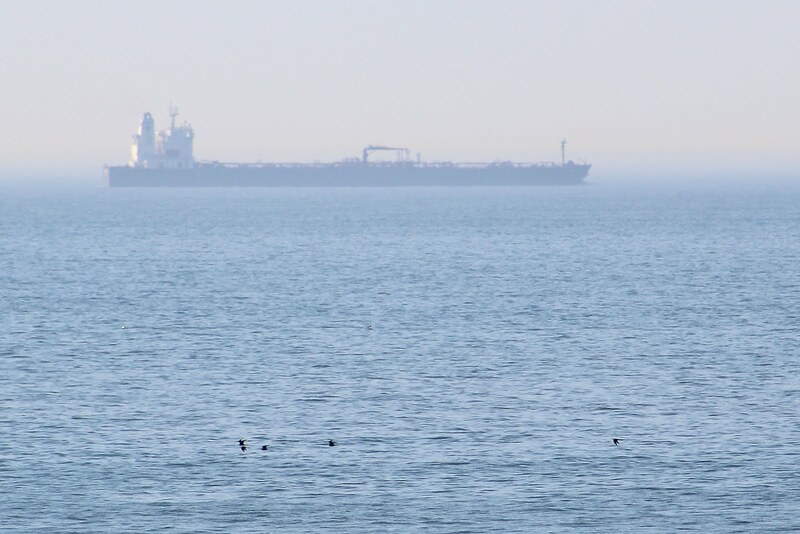 I hadn't seen Dodge for more than a year so it was great to catch up for a bit a banter during the afternoon Pom seawatch. The late afternoon/evening session ended up being quite productive, this time I watched the sea alongside Stephen Message – who happens to be a fine wildlife illustrator – and another birder (who's name escapes me), and by 7.30pm we clocked five Pomarine Skua, one in particular being a fine specimen, Stephen exclaiming: "Look at the spoon on that!" 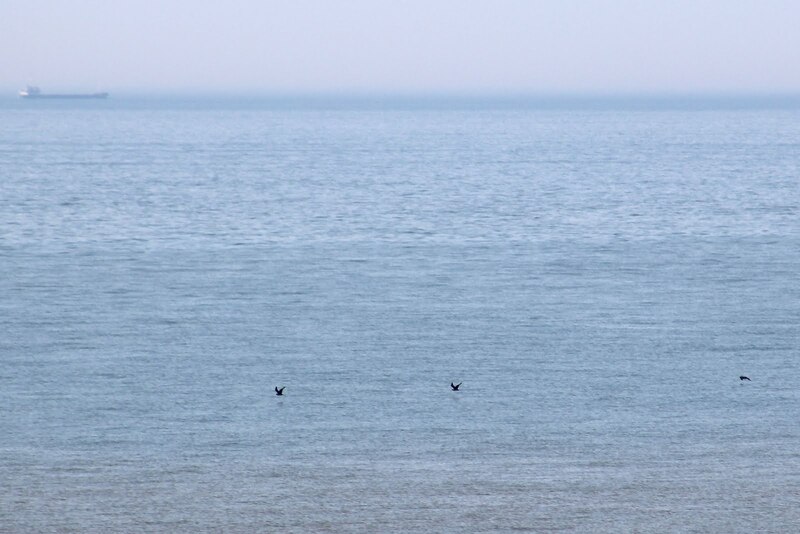 Two Arctic Skua landed on the sea at one point and I was first one on to five Eider, including two males. During a long but rewarding day I saw 25 Pomarine Skua and three Arctic Skua, plus 20 Brent Goose, five Eider, plenty of Common Scoter, four Red-breasted Merganser, four Black-throated Diver, numerous Gannet, one Hobby that came in off the sea then flew back out again, nine Whimbrel – one of which came in directly from the sea and landed on the beach, one Knot, three Sanderling, four Mediterranean Gull, four Kittiwake, as well as a stack of Sandwich Tern and Common Tern. A very pleasing total. I wondered what the following day would bring. As it turned out, not a lot but definitely one that got away. As a picture postcard sun rose above the Channel on Sunday morning I arrived at the same time as another birder, Charles Trollope, who had come down from near Tenterden. In a remarkable coincidence it transpired Charles was born in Redhill and his first birding patch was Holmethorpe Sand Pits! In those days it was still a productive quarry and a complete contrast to the Surrey Wildlife reserve it is now. 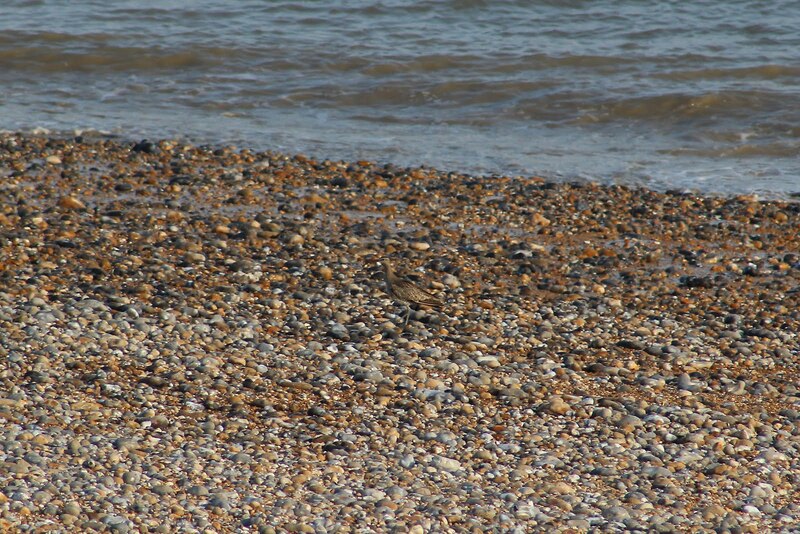 He had come to Dungeness just for a few hours in the hope of seeing his first Pomarine Skua, but alas it was not to be. 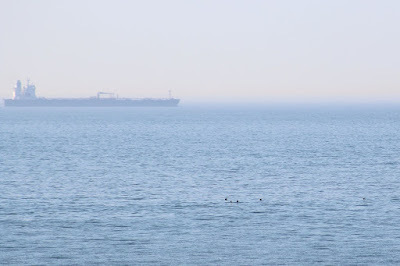 The sea was like a mill pond and seawatching proved taxing. 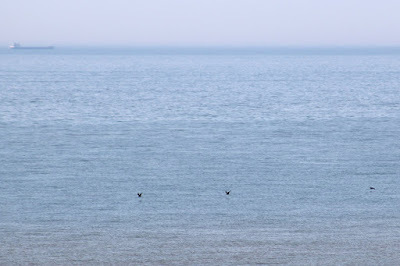 The best birds of the morning were three Black Tern, feeding on the area known as 'the Patch', just off the headland from the nuclear power station. When the power station is being used it draws more than 100 million gallons of sea water from the sea to cool the turbines. The waste water is then pumped back out to sea via two pipes. The mixture of waste water and sewage attracts gulls and terns by the hundreds. 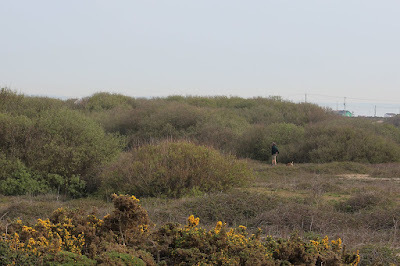 While Charles, Dave Walker, another birder and I watched very little, suddenly a tweet popped up – a Bee-eater had been found by Owen Leyshon in the trapping area in front of the observatory! The 'obs' was only about 400 yards away so we all scurried to our cars and in a few minutes were scouring the area for the Bee-eater. 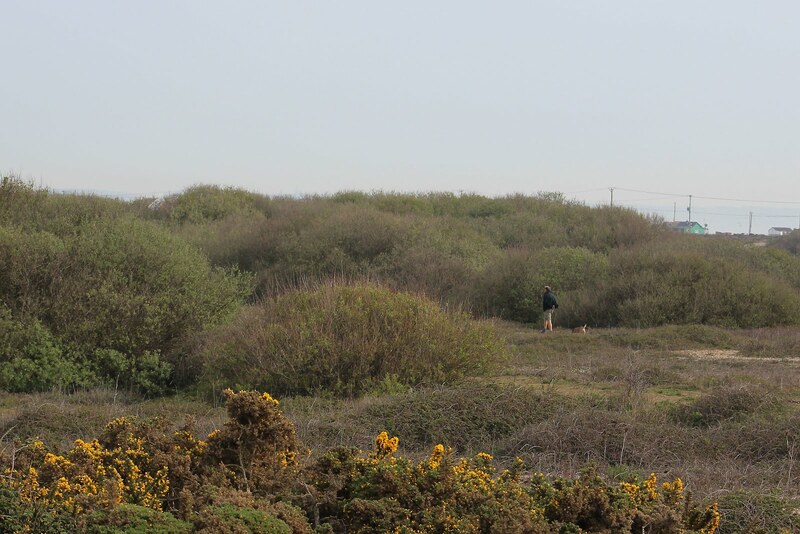 Already on site was top local birder Paul Trodd, with his trusty companion, his terrier Barney. Unfortunately the Bee-eater could not be relocated – a great pity. At this point Charles had to set off back home, and not long after I bumped into Steve Gale of North Downs and Beyond blog fame, who had just arrived for a week's birding (and all that green stuff he likes to look at). 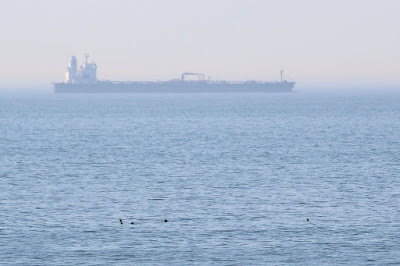 I spent most of the day viewing the sea and while it wasn't the best days birding by any means I still managed to gather what, by my standards, is a reasonable list of birds. 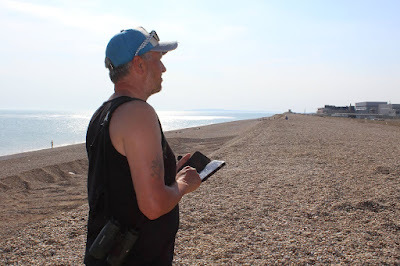 They included two Mediterranean Gull, the three Black Tern, one Grey Plover, one Dunlin, nine Bar-tailed Godwhit, one Whimbrel and six Common Sandpiper that landed briefly on the beach. 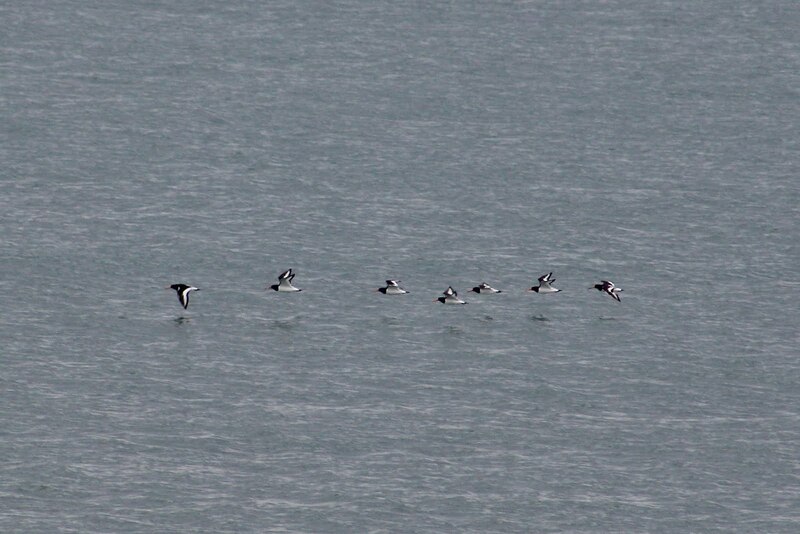 The highlight of the day was late on when homing in on a flock of waders that flew past my field of vision. 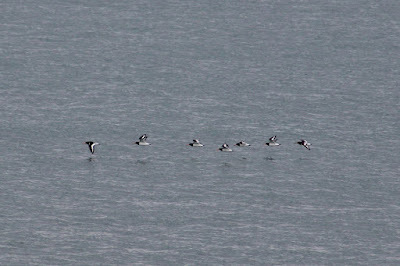 While I was attempting (and failing) to id them through the scope they overtook a Pomarine Skua I must have missed! So ended what was a very enjoyable couple of days, meeting up with old birding friends and making plenty of new ones.